Asthma, a chronic disease that inflames the airways and makes it difficult to breathe, affects about 8.3 percent of children in the United States. The disease is potentially fatal. In 2016, there were 3,518 asthma deaths. Asthma death rates are highest among adults aged 65 and over. Among children, the asthma death rate in 2016 was 2.8 per 1,000,000. Asthma is more common among racial minorities. Research published in 2014 in the Journal of Allergy and Clinical Immunology shows increasing disparities in asthma prevalence between black and white children from 2001 to 2010; at the end of this period, black children were twice as likely as white children to have asthma. According to the most recent Centers for Disease Control and Prevention data, asthma prevalence in black children stands at 15.7 percent, compared with 7.1 percent among white children. Socioeconomic factors can also play into disparities in asthma prevalence; obesity, mold, cigarette smoke and pests can trigger the development of asthma and asthma attacks. A good amount of research documents asthma disparities and prevalence trends in the United States. This research, which pinpoints the extent of the problem, is complemented by a body of literature that addresses potential solutions. In this roundup, we highlight solutions-oriented asthma research from the past few years, which spans from pest management interventions to hospital-based programs to green housing initiatives. Gold, Diane R.; et al. Journal of Allergy and Clinical Immunology, October 2017. Looking for an overview on the state of the research about interventions to reduce the incidence of asthma and to improve asthma control? This report summarizes 20 years of scholarship. Lang, Jason E.; et al. Pediatrics, December 2018. Obese children were 26 to 38 percent more likely to be diagnosed with asthma than children with normal-range body mass indexes (BMI). Overweight children were 8 to 17 percent more likely to develop asthma than their peers with normal-range BMI. The authors estimate that between 23 and 27 percent of new asthma cases in children with obesity are directly attributable to obesity. Jhun, Iny; et al. The Journal of Allergy and Clinical Immunology: In Practice, January 2017. This study tests the effects of classroom-based air purifiers (Coway AP-1013A models) on the symptoms experienced by children with asthma. The 18 classrooms involved in the study were located in three urban elementary schools in the northeastern United States. Indoor air pollutants – black carbon and fine particulate matter — were reduced in intervention classrooms by around half. Students in the intervention classrooms saw a “modest improvement in peak flow,” which measures how well the lungs are working; however, there were no significant changes in asthma symptoms or in forced expiratory volume in one second, which is a measure of lung strength. Matsui, Elizabeth C.; et al. JAMA, March 2017. Rodent infestation is a common problem in inner-city neighborhoods, and these pests are a source of allergen exposure and asthma exacerbation. This study tests whether professional pest management targeting mice reduces the symptoms experienced by children and adolescents aged 5-17 years with asthma. This randomized clinical trial involved 300 participants in Boston and Baltimore. Comparing the group that received professional pest management with those who received pest management education alone (“written material and demonstration of the materials needed to set traps and seal holes”), there were no significant differences in the primary outcome studied — the highest number of days participants experienced symptoms in the previous two weeks. Kercsmar, Carolyn M., Andrew F. Beck; et al. JAMA Pediatrics, November 2017. This study assesses a “hospital-driven improvement collaborative,” among Medicaid-insured children with asthma in Hamilton County, Ohio, which totals approximately 13,000 children aged 2 to 17 years. “Interventions were implemented in 3 phases: hospital-based inpatient care redesign, outpatient-based care enhancements, and community-based supports,” the authors write. Specific interventions included giving all patients a 30-day supply of asthma medications for home use, standardized inhaler training, an asthma action plan, up to five in-home nurse visits and partnering with public schools and the Cincinnati Health Department School Nursing Program to build the quality of care delivered to students (for example, facilitating records sharing between the Cincinnati Children’s Hospital and school nurses to improve communication of asthma action plans and information on hospitalizations). The outcomes of interest were asthma-related hospitalizations and emergency room visits. Asthma-related hospitalizations decreased from 8.1 per 10,000 Medicaid patients per month to 4.7 per 10,000. Emergency room visits decreased from 21.5 per 10,000 Medicaid patients per month to 12.4 per 10,000. The proportion of patients who returned to the hospital or emergency room for asthma within 30 days of their first hospitalization was reduced from 12 percent to 7 percent. The proportion of primary care patients with documented well-controlled asthma increased from 48 percent to 54 percent. Murray, Clare S.; et al. American Journal of Respiratory and Critical Care Medicine, July 2017. For children whose asthma is triggered by dust mites, this study examines the effects of dust mite-impermeable bedding on hospitalizations for severe asthma. 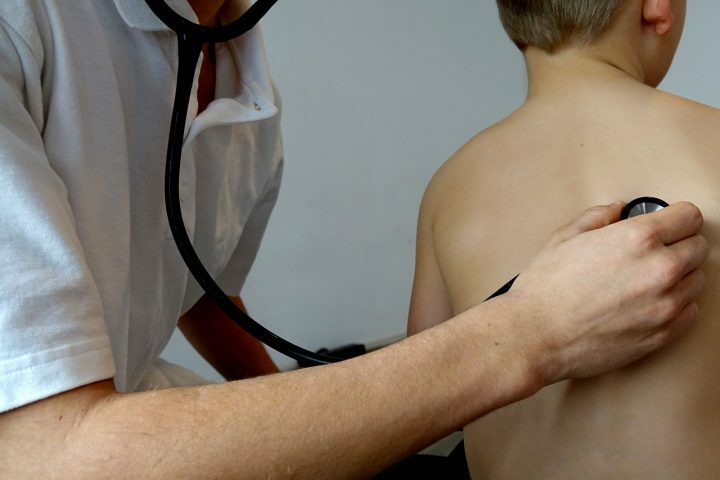 The study involved 284 children recruited from 14 hospitals in northwest England. 146 received mite-proof pillow, mattress and duvet encasings. 138 received placebo encasings – poly-cotton pillow, mattress and duvet protectors that matched the mite-proof encasings in appearance but not in function. Parents received instructions to wash and apply the encasings to their children’s’ beds. In the year following the start of the intervention, significantly fewer children who received the mite-proof bedding had gone to the hospital for an asthma exacerbation. Specifically, 29.3 percent in the mite-impermeable bedding group went to the hospital versus 41.5 percent in the placebo group. Rabito, Felicia A.; et al. Journal of Allergy and Clinical Immunology, August 2017. Cockroaches are another asthma trigger. This study tests the effects of insecticidal bait on cockroach exposure and asthma outcomes among 102 children enrolled in a year-long randomized controlled trial in New Orleans. The study population was 62 percent black, 30 percent Hispanic, and 8 percent other. 40 percent lived in multifamily homes and 60 percent lived in detached homes. The cockroaches took the bait: intervention homes trapped, on average, over 13 more cockroaches in the year-long study than control homes. Kids in control homes had more asthma symptoms and unscheduled health care visits than the intervention group: “Children in control homes were found to have 1.82 additional symptom days in the previous 2 weeks.” They also had a higher proportion of participants with airway obstruction. Frey, Sean M.; et al. Academic Pediatrics, November 2016. This study indicates that one significant contributor to children’s asthma symptoms is failure to use preventative medications as they are prescribed. The researchers wanted to test whether kids weren’t getting their medications because of parents’ difficulty identifying medications by name. To test this idea, the researchers asked caregivers of children with asthma to list by name their child’s inhaled medications and to say whether they agreed with the following statement: “it is easy to remember the names of my child’s asthma medications.” The study drew on a sample of 141 caregivers. Though most participants — 74 percent — said they found it easy to remember medication names, only 46 percent were able to name their children’s medications accurately. Caregivers who did not find it easy to remember medication names were less likely to name their children’s medications accurately. In addition, their children were more likely to experience more than two days experiencing asthma symptoms per week, and were more likely to have missed more than one dose of preventive medication in the past two weeks. Kenyon, Chén Collin; et al. JMIR Research Protocols, June 2016. Researchers provided families with electronic monitors for asthma controller and rescue inhalers. These monitors recorded inhaler use and connected to a system that issued alerts if rescue medications were overused and if controller medications were over- or underused. Families also received support from asthma navigators (“a community health worker with background expertise and training in the care of children and families with asthma”) and motivational interviews to encourage medication adherence. The feasibility study, which involved a small sample of 14 black children, had mixed results. On average, asthma control test scores improved, and over half of caregivers surveyed believed the device helped to improve asthma control. But nearly one-third of the participants had trouble with the devices: “no modem signal was transmitted for five of the 14 participants after a mean of 45 days.” Some participants lost their devices, others unplugged them because of competition for use of outlets and concerns about increased electricity bills. Mankikar, Deepa; et al. International Journal of Environmental Research and Public Health, September 2016. This study tested a home-based intervention called “Healthy Homes.” The researchers visited homes, assessed the health and safety hazards, distributed cleaning and pest management supplies as well as smoke and carbon monoxide detectors. They also offered education about ways to maintain a healthy home, describing various hazards such as mold, lead and moisture, action steps to address these concerns, and additional resources. Another home visit occurred two months later to assess changes in participant knowledge and awareness of hazards in the home, children’s asthma-related medical use – including hospital admissions, as well as emergency room and doctor visits — and the presence of asthma triggers and hazards. The study involved 150 families in southeastern Pennsylvania. The families were 71 percent black, 57 percent Hispanic and 18 percent white (totals exceed 100 percent because families could indicate multiple responses). 59 percent of families lived in row homes or duplexes, 23 percent lived in apartments, 16 percent lived in detached single-family homes, and 2 percent lived in manufactured homes. After the intervention, families reported a significantly lower three-month rate of asthma-related doctor visits and hospital admissions for their children. Participants showed improvement in knowledge and awareness of hazards in the home. Turcotte, David A.; et al. American Journal of Public Health, April 2014. The intervention “showed a statistically significant health improvement from baseline to follow-up.” The children had fewer asthma symptoms, hospitalizations, emergency room visits and doctor office visits. Associated cost savings amounted to an estimated total of $821,304 annually for the 170 children in the study. Colton, Meryl D.; et al. American Journal of Public Health, December 2015. This study compares residents in conventional public housing to those in “green” public housing, which are more energy efficient and constructed out of environmentally friendly materials. “Current green building guidelines aim to avoid health problems by incorporating environmental quality and health goals into construction and renovation practices,” the authors write. The study tracked a total of 188 adults residing in three public housing developments in Boston over a year. Compared with conventional public housing, green homes had lower percentages of every negative environmental indicator studied, including inadequate ventilation, mold, secondhand smoke and pests. Wondering how asthma affects children in your community? Using data from 2000 and 2010 scholars from Texas A&M University and the University of Washington created an interactive map that shows the distribution of childhood asthma due to nitrogen dioxide (a component of traffic pollution) at the county-level.